December 7, 2015, Pearl Harbor Day, marks the 74th anniversary of the Japanese air attack on U.S. naval and air installations at Pearl Harbor, HI, at 7:53 a.m., Dec. 7, 1941, without a declaration of war. It was then the worst attack on American soil in history: Some 2,403 died, 2008 of them Navy personnel; another 1,178 were wounded. Eighteen Navy ships, including the U.S.S. Arizona, were sunk or damaged. 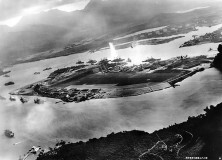 Almost all the planes at the island bases were destroyed or damaged while still on the ground. President Franklyn D. Roosevelt memorably called December 7, 1941, “a day which will live in infamy” in his dramatic speech to Congress, which then declared war on Japan. Only the sneak attack on America by radical Islamic terrorists on 9-11-2001 in New York resulted in more deaths. But for many Americans of this generation — and millions of immigrants, legal and illegal — the significance of Pearl Harbor is not fully known, or appreciated. “Ordinarily, we would have been at sea. We were at Pearl Harbor because we had to repair an engine that had been sabotaged at the shipyard back in California. I was up on the fantail of our ship, the USS New Orleans, a heavy cruiser, with the Chief Master at Arms. The Quartermaster was there, getting ready to raise the flag,” Hemker recalls. They were grinning at us as they went down toward Battle Ship Row. Grinning at me and the Chief. They were so close, you could have thrown something at them and hit them. A potato, maybe. “It was 7:53 a.m. when we saw the Japanese planes. They were flying so low I could see the pilots’ faces in the cockpit. They were grinning at us as they went down toward Battle Ship Row. Grinning at me and the Chief. They were so close, you could have thrown something at them and hit them. A potato, maybe. They were that close. Just skimming the top of the water. Torpedo planes. The pilots grinning at us,” Hemker reluctantly, but vividly recalls. “The loudspeakers blared: ‘Man your battle stations – the Japs are attacking’. All hell broke loose.. It was terrible, horrible, …,” he says, pausing in his remembrance. “The Arizona capsized. Thirteen hundred men went down with her. Half the guys I was with in boot camp died on the Arizona. That’s where the Memorial is today. They say that oil still leaks out every day. Those guys…they’re still down there,” Hemker says quietly, his voice trailing off, as if physically turning away from a memory, and reality, which is still too painful to talk about. Getting Hemker to talk about it at all is no easy task. Like many of his fellow World War II veterans, he still doesn’t talk about his war experiences, never expects any thanks or gratitude, and never, ever boasts about it, despite the fact that after Pearl Harbor he served America in battles and combat zones for the duration of WWII, in the Korean War, and in Vietnam. Hemker is a widower whose wife died more than 20 years ago. He has three sons. All served in the Vietnam War. Hempker, still roguishly handsome and possessed of a sly sense of humor, charms the ladies in the Legion Auxiliary with country gallantry. He is universally admired by his comrade veterans in the American Legion. “I’m not able to do what I used to do, but I do what I can,” he says. “We Americans should never forget. If we forget our past and those who died, we won’t have a future. A free one, anyway. Look at what happened on 9-11. More people were killed on that day then were killed at Pearl Harbor. It can happen again,” he warns.